A show garden at this summer’s RHS Hampton Court Palace Flower Show celebrates women’s influence in gardening since the Victorian era in a collaboration between quintessentially English floral fragrance house Yardley London and long-standing charity for horticulturists Perennial, both of which have roots firmly planted in British floral heritage. Designed by Jean Wardrop and Alexandra Stevenson, A Growing Obsession – the Yardley London Perennial Garden is inspired by the Victorian English Garden, recreating the elegance of a ladies’ flower garden. 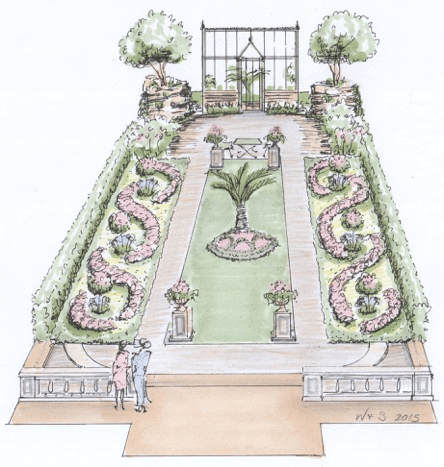 The concept for the garden was inspired by a book published in 1840 entitled 'Instructions in Gardening for Ladies' by Jane Loudon, whose writings helped make gardening more accessible. The British obsession with gardening goes back to this era, a time when it began to cross gender and class divides and more people started to enjoy gardening as a pastime. The garden evokes an atmosphere of refinement and femininity that mirrors the delicate floral fragrances of Yardley London’s new Contemporary Classics range, which includes English Lavender, English Rose, Lily of the Valley and April Violets. The planting plan includes romantic roses and lavender, which capture the essence of the fragrances. From the great Victorian gardening tradition came the foundations of Perennial as a benevolent charity. In 1839, the custodians of Britain’s great estates came together to establish pension funds for their sick, injured and elderly gardeners. Perennial was born and today is the UK’s only charity dedicated to helping all people who work in horticulture, and their families, when times get tough. Quentin Higham, Managing Director at Yardley London says “English flowers make up the DNA of Yardley London and have been used in its fragrance development since the House of Yardley launched English Lavender in 1770. We are delighted to be sponsoring the show garden, ‘A Growing Obsession’, at the RHS Hampton Court Palace Show to celebrate the launch of our new Contemporary Classics Fragrance Collection. We have reformulated, repackaged and re-launched our four core floral fragrances – English Lavender, English Rose, Lily of the Valley and April Violets. The bath and body products also now contain even more natural extracts for added benefits and all products are free from parabens and mineral oils, containing up to 95 per cent naturally derived ingredients. A Growing Obsession – the Yardley London Perennial Garden reflects the ornate grandeur of the Victorian age, with the formal, geometric shapes of the bedding, pathways for promenading and a terrace with balustrade framing the view. It features a decorative glasshouse, supplied by Griffin Glasshouses for the show, to host exotics, which were imported from around the world and gained great popularity during Victorian times. Another Victorian feature is the fernery, which was highly fashionable in the 19th century, where a variety of mosses and ferns grow up amid a vertical rockery. Historical themes and gardening heritage will be a strong element of this year’s RHS Hampton Court Palace Flower Show, as the event celebrates its 25th anniversary and promises to be more spectacular than ever. This year also marks the 500th anniversary of the Hampton Court Palace itself. Perennial offers free, confidential advice and support to everyone working in or retired from horticulture and their families, including gardeners, landscapers, nursery and garden centre staff, parks and grounds care staff and tree surgeons. People turn to Perennial for financial and emotional help in times of need because of disability, sickness, poverty, financial hardship and old age – although increasingly younger people are seeking their assistance. Many individuals describe the services Perennial offers as a 'lifeline'. The work of Perennial depends entirely on voluntary donations from the horticultural industry and the garden-loving public. Find out more at www.perennial.org.uk. Follow on Twitter @PerennialGRBS or find us on Facebook. Yardley London is a quintessentially English fragrance brand, which has been capturing thedelicate fragrance of flowers since 1770. One of England’s most distinguished heritage beauty brands, Yardley London is an established purveyor of authentic and credible quality floral fragrances and ancillary body products, made in Britain. The Contemporary Classics range combines quality ingredients infused in four contemporary, refreshing scents – English Lavender, English Rose, Lily of the Valley and April Violets – to create a modern British classic. All products in the Yardley London Contemporary Classics floral fragrance range are paraben, cocomide, DEA and Mineral Oil free and contain up to 95% naturally derived ingredients. Find out more at www.yardleylondon.co.uk. Follow on Twitter @YardleyLondonUK or Facebook. Jean Wardrop worked at the Fulham Palace Garden Centre for 18 months and also worked with Mark Lutyens designing a project for a private client. She graduated with a BA (Hons) first in Garden Design at Greenwich University in 2000 and has been running her own garden design business since 1997. Alex Stevenson graduated from Sheffield University as a Landscape Architect in 2001. She has worked for private practices in the North West, North East and South East of England; and worked for 5 years in Canberra, Australia. Her portfolio of projects includes quarry restoration, commercial developments, schools, parks, care homes, (specialising in dementia care gardens) and the Turkish Embassy, Canberra. This is her first foray into the world of show gardens where she is launching her own design business. Find out more at www.wardropdesigns.co.uk . Follow progress on Facebook.